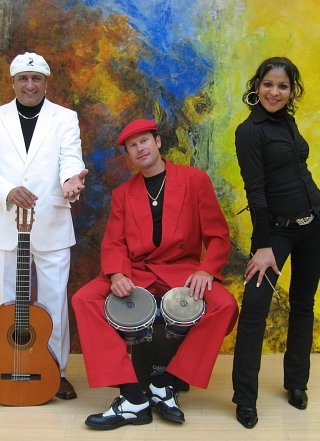 Two acoustic guitars, Cuban accordion and percussion enchant you and your guests with a feast for eyes and ears. Your sparkling blend of Gypsy Swing and Latino Lounge Sound offers timeless songs that sparkle with vitality only so and those full of bittersweet melancholy. Even for the visual impression they have paid attention to every detail. From Spanish guitars over their stylish clothing to accessories, such as wooden boxes and bags of coffee from Latin America. It offers a beautiful stage design in natural colors. “Sol de Oro” are perfect for occasions that are devoted to the cozy togetherness. With music, the relaxed style and volume stimulates communication among your guests and it never interferes. Exceptional and elegant songs newly interpreted. At the interface of Easy Listening, Lounge, Soul and Jazz “Relounged” play relaxing music for connoisseurs. Worn by trendy beats, you will be seduced enchanting voice of Annika that is clear to chill, cool, stimulating and relaxing. When eating “Relounged” plays dinner music chamber in a music concert. For reception, they play unplugged on a discreet background music, as a party band to Mass Party – bossa nova, jazz standards and pop songs played with great passion. Pamper your guests with a musical Gaumenkitzel. together, Relounged guarantees that will conjure you a smile `s face. Particularly suitable for events with “space problems”, since no technical effort has to be done. to be entertained? If yes, then this group is just the thing. Since Voice Three does not require any equipment, the boys also play on the train, plane, and submarine, in the cottage, on the farm, on 3000 m height or elsewhere. 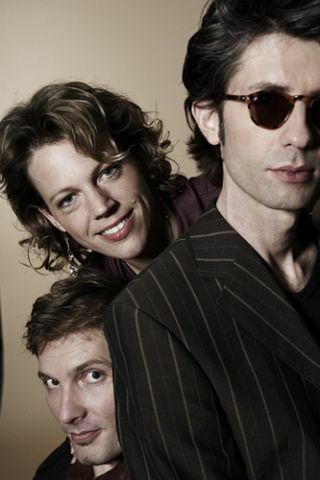 Their repertoire is vast, ranging from “Bryan Adams” and “Bob Dylan” to “Cat Stevens” or “Elton John”. The motto of The Lonely Boyz is clear and concise: Reduce to the Max! Three lonely hearts, three acoustic instruments, a bag full of hits and the party! 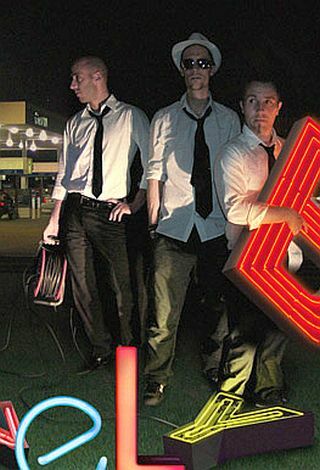 On their journey through the history of rock and pop The Lonely Boyz have played the best songs of the Beatles, Elvis, The Police etc. (and a fewIlluminated letters). In their crisp occupation of acoustic guitar, bass, drums and two voices they rock any audience toEcstasy! The Lonely Boyz are the original copy of the endangered “band” species. They know each other from the sand pile and have smoked together since the primary school. Far from casting shows and Music Star juries they have days with a lot of sweat and passion in old moldy imprisoned band rooms, to get the magic of rock and roll on the track. Now they are there. With a new show that every party can be the absolute highlight. 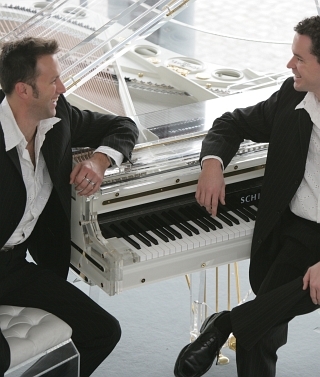 The “2 you-acoustic duo” – is ideal for your event, wedding, christening or corporate Christmas dinner. The two musicians carry their program skill fully and subtly, so that they experience a celebration with a suitable musical setting. It is a show followed up with a guitar and a polyphonic singing. 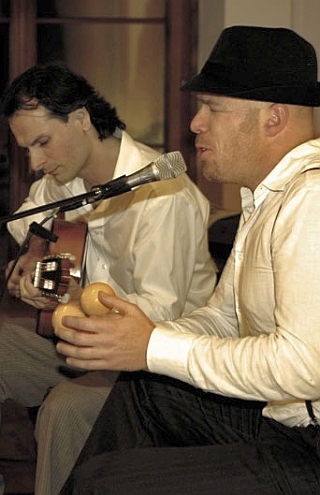 These are the musicians of the duo whose music makes the right atmosphere for every occasion. Their repertory is with a lot of oldies, as well as the latest hits from the international charts. From “Sweet Home Alabama” about “Lady in Black” up to “Let It Be” or “Yesterday”. And the best thing is that the musicians perform in the smallest space they can. Without technical frills or with a very small sound system. Particularly, they are very suitable for events with “space problems”, since no technical effort has to be done. No microphone, no amplifiers, no stage. 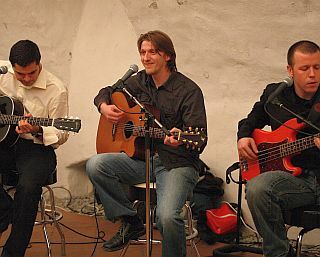 The acoustic band playing – as it says the band’s name – purely acoustic in the middle of the crowd. 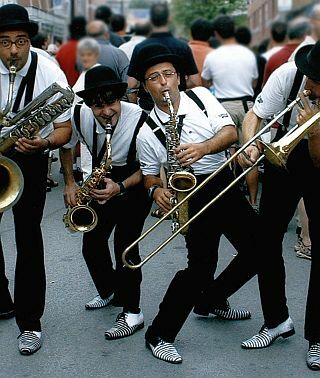 The basic occupation consists of 5 musicians. They play rather in an aperitif, during dinner or even between the food aisles. Swing, Bossa Nova, Jazz, evergreens, oldies and new songs from the popular hit parade belong to rich program that have these sympathetic musicians. Creating a comfortable level where it also needs this. No space problems – No stage – Circulating. Made in Switzerland! 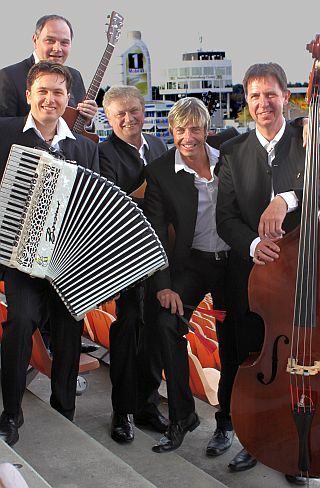 For traditional Appenzell music, this world-famous family also Naturjodel with Talerschwingen and the famous Schellenschötten and alphorn and yodel solo. With the very specific 20 –minutes Swiss Folklore Show it “sold “the Switzerland ensemble which is always perfect. The concert will be commented on in a High German. 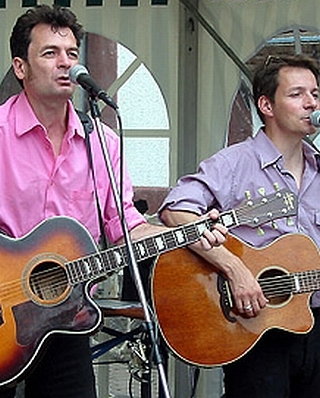 The Alder’s have mostly played in Switzerland. 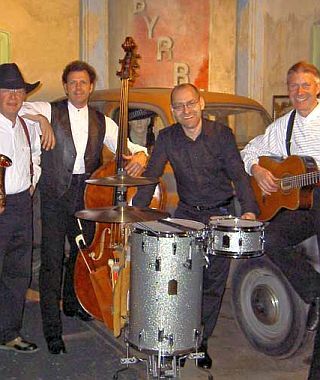 Very often, they are also on extended world tours, as well as the photo shows, together with world stars such as “Dolly Parton”. This premier Ladies Trio is especially suitable for small exclusive events. The excellent musicians playing saxophone, percussion and guitar. The band plays of discreet background and lounge music to flattered entertainment music with the most famous melodies from: Swing, Rock’n’Roll, contemporary music, film music from James Bond, Pink Panther, Blues Brothers as well as songs by the Beatles or Elvis Presley. Of course, the musicians change their stage clothes for each play set. In a volume and the program they love to answer questions. The application possibilities are almost unlimited, because the band does not need sound equipment, whether directly between the audience, for receiving guests or with background music for dinner, as an act on the stage, on a stand, on a ship or outdoor on a terrace …! 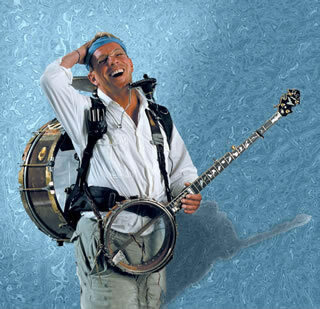 Derrick Feole is originally from Boston (USA) and practically his whole life long he was involved in the music business. 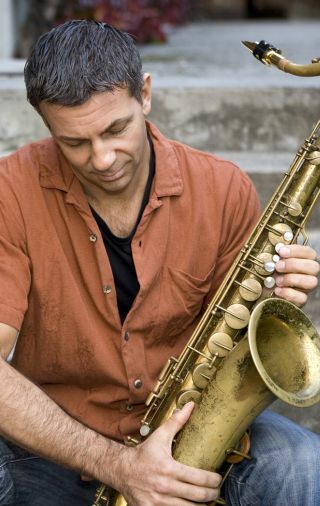 At first, he played the piano before 1987 when he joined the saxophone. He had the immense good fortune, the legendary Joe Viola, in his capacity, the saxophone player with Glenn Miller, helped him perfecting his saxophone playing. Derrick is particularly well suited for private viewings, business receptions or trade fairs of all kinds. A pleasant top musicians with a huge repertoire. “Salt & Pepper” bring spice to your event because the group may be involved according to your wishes as a duo, trio or quartet. “Outfit moderately” at: fine or casual, country-style or as a minstrel. Enjoy it according to your individual preferences compiled: guitar, piano, singing, on violin, bass, saxophone, clarinet, pan flute, percussion, blues harp, whistling and steelpan. With the right feeling and the experience of 15 years in professional business make the “Second Hand Brothers” to always find the right musical setting for any event. Oldies at its best, of “Blowing in the Wind” to “Hey Jew” – from ABBA to Zappa. Outstanding vocal and absolute skill on the instrument enable the band to nothing less than to meet almost every musical desire of the public. One could almost forget that the trio manages this to the audience to an unforgettable musical evening with acoustic guitar, bass and drums / percussion. Whether it covers pop / rock songs, jazz standards or put their own stamp or play their own songs, John Cordi always sounds independently. Whether gala dinner, company anniversaries, in the Irish pub, or at private occasions, John Cordi always succeeded to conjure an atmosphere that can dissolve the stress of everyday life. You are driving and you fuel the love of life and you should not be missing at any festive occasion. Your fine and racy elegance are confident at every celebration, party and fair. Just when space is limited and it should not be too loud. There is talk of “Discover 3″. The Guitar Trio plays the best hits of the last three decades. From “Eric Clapton” and “Lenny Kravitz”, about “Maroon Five” and “Robbie Williams to” Billy Idol “and” Limp Bizkit “. The ingredients of the fine wines: three men, two votes, three guitars. If Discover 3 has to be on stage, the audience will enjoy an acoustic champagne shower which will be really tangy, fresh and extremely tasty. Particularly suitable for events with “space problems”, since almost no technical effort has to be done. 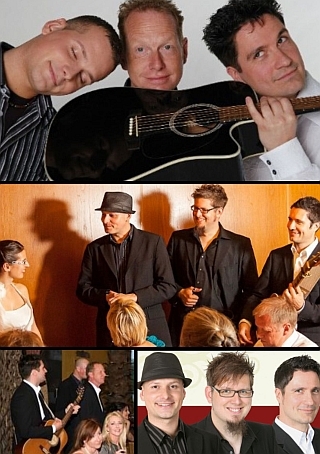 “From” U2 “to yodel, of” Verdi “to” Rod Stewart “, from Swing to the” Jackson 5 “: A-Live ACAPELLA offers you everything your heart desires. With their new hammer program of musical super-hits and a good pinch of humor a-live ACAPELLA excited for years their audiences at home and abroad. The variety show is underlined by the Multinationality of a live-boys. Learn how “A Capella-Stars” (“View”) know: Jon Colbath (the funny Americans), Francesco Saraceno (the voiced “Italian Stallion” from Rome), Dani Lüdi (the lively Lucerne), Stephan Schaberl (the confused Austrians), Marco Kunz (the young hothead from Lucerne) and Christian Ertl (the rock singer from Germany). With their new show “still different” builds a-live ACAPELLA on the successes of past tours. With many standing ovations, the boys not only touched, but also taken in the duty this year their audience again with a new hammer program to inspire them again. In the direct and spontaneous encounter with the audience, they developed their incomparable style, for which there is no parallel. No other band achieved during the performance even remotely this symbiosis of a theatrical-musical communication show with the audience. The performance brims of spontaneous and living arrangements. Music, drama and the contact with the audience represents the realization of a unit. For the audience the original presentation is an encounter of the loving kind. Live saxophone performance at its best. Pure pleasure and hot songs. Whether subtle framing or groovy party sound with interludes. Unforgettable saxophone sound and show at the very highest level! The priority task of Soulsax is creativity, professionalism, flexibility and the needs of customers. 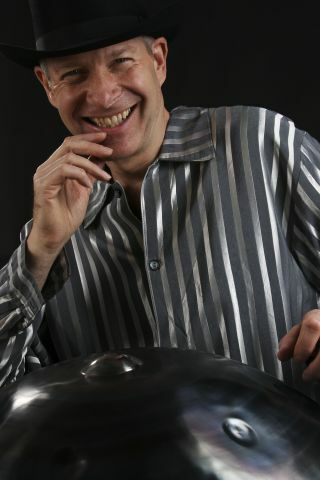 You can rely on years of experience, a complete service around music and international top references! Hot Sax Club: this is Swing, Jazz and Groove, mixed with a lot of show. Presented by four very pretty ladies or the option of using a handsome man. Their instrument is the saxophone. Of course, they do not require power, because they play purely acoustic. Therefore, they have very flexible and usable circulates. Whether small cocktail party or in a large hall, on stage or at the swanky pool – the possibilities of this band seem limitless. In short, both visually and musically the finest eye and ear candy! This is Cuba’s music and poetry of the legendary district of Havana. This formation thrilled with the beautiful Cuban songs, the rhythms of Rumba, Mambo, Bolero, Son Cubano, Salsa and Merengue reflect the pure Caribbean joie de vivre. Of course, all the songs from “Buena Vista Social Club” come with a great repertoire. The excellent musicians from Cuba play circulated and unreinforced among the guests or on the big stage, but then very strengthened. New: Under the motto “Music and cigars” A Buena Vista is now available with the sympathetic Zigarrendreherin Alicia from Cuba (see photo). That Cigars are turning the event nor a very special touch. Something typically Cuban to experience and enjoy. The Beverly Brothers play the good old music of that time. The two professional musicians sing wit acoustic guitars and two perfectly tuned vocals that play the gentle songs from the heyday of rock and roll. Title of the Beatles, Simon & Garfunkel, the Everly Brothers, Bob Dylan, Bruce Springsteen and many others are part of the repertoire of the band. The concerts of Beverly Brothers are fanned by the cute and funny moderation between songs. Especially suitable for smaller events with little space since no technical effort has to be done. Brand new in our program! The Poker Kings trumps. No catchy escapes from their repertoire: from the beads submerged radiograms to the current chart sweepers, they drag all musical registers of 20 Century. 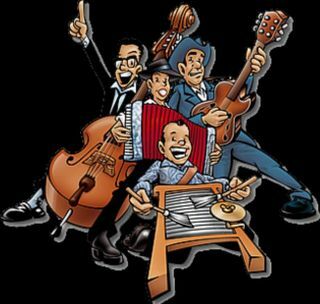 The nostalgic cast of guitar, bass, washboard or Cajon and using polyphonic singing, they produce their distinctive sound, which has already proven itself on countless events and activities as a guarantee of absolute party atmosphere. They’re elegant 40 years that blend into any outfit clothing etiquette and complete their performances from optically since they can be quite loud without electricity, they are always right there ready to play, where they are needed. With thunderous blows full of force, vitality and enthusiasm, pull the drummers of TAIKO lineup audiences blow for blow in its spell. 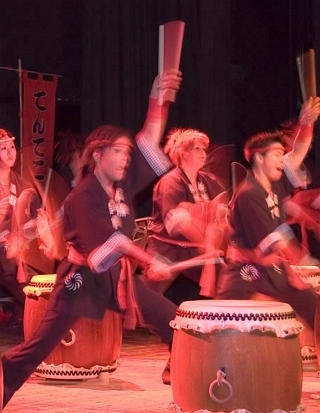 The impressive traditional machining Taiko sounds, associated with concentrated body control and the sparkling radiance of drummers make every event a special highlight. Pure enthusiasm…! “La femme avec l’Accordéon” – The attractive Coloratura soprano has a classic vocal training and converts it with charm, wit and verve skillfully in the footsteps of nostalgic Chansonettes and diseuses, from Von Brecht, Weill and Piaf to Musettes and Tangos. It shows all the facets of a woman who Kess and lascivious, then melancholy again or melodramatic about love and the men sing. Particularly suitable for events with “space problems”, since no technical effort has to be done. 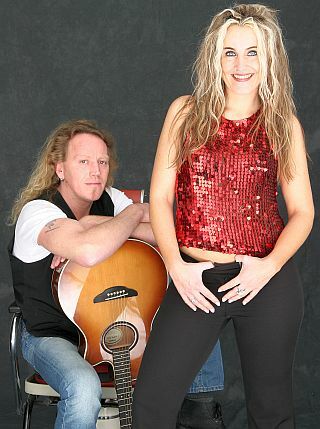 The musical style of this formation is – with guitarist and singer George Gery – ranging from the most beautiful, smoky ballads to the pearls of rock and pop history. Just Two play exclusively cover songs, partly acoustic and partly supported by the sequencer. However, they are always locally and stylistically adaptable. Especially suitable for receptions and small corporate events with no sound system. The time of boring recitals is over. Definitely. For more than 10 years Pianotainment offer class piano entertainment. Their show is fast-paced, perfect and funny … You think that on a grand piano you can only play the piano? Not even close! Pianotainment bring the blades to a boil! 4 hands and a Keyboard = entertainment that goes into the ear and under the skin. It is quite an experience as such, with which Chris virtuosity produces the sound of a full band. Blues, Rock ‘n’ Roll & Evergreens are the Originality of their presentation to a rousing performance of a special kind. Vocals, banjo, blues harp & drums. An interactive show for indoor & outdoor events. Optimal also for events in a small space by mobile, battery-powered PA system. Particularly suitable for events with “space problems”, since no technical effort has to be.